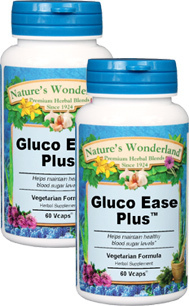 Gluco Ease Plus™ - 525 mg, 60 Veg Capsules™ each (Nature's Wonderland) - Penn Herb Co. Ltd.
Support healthy glucose levels with this classic herbal formulation. It combines the 2,000-year-old Ayurvedic herb, Gymnema sylvestre, known to support healthy glucose metabolism, plus supportive herbs for healthy kidney function. Gymnema Sylvestre… In traditional Ayurvedic medicine, Gymnema is known as ‘sugar destroyer’ because the leaves, when chewed, interfere with the ability to taste sweetness. Its active compounds have been shown to help support healthy glucose metabolism through its ability to promote healthy pancreatic function. Jambul…indigenous to India and Suriname, the seeds are traditionally used for healthy blood sugar support. Dandelion, Uva Ursi, Couch Grass…herbal blend support healthy kidney function. Supports healthy blood sugar levels already within the normal range; supports healthy pancreatic function; supports healthy kidney function. As an addition to the daily diet, take 1 or 2 capsules 3 times daily with water at mealtimes. SEE LABEL FACTS BOX FOR CAUTIONS.